Atletico Madrid coach Diego Simeone praised his players' mothers for nurturing a winning mentality after reaching the Champions League final. The Spanish side came from behind to beat Chelsea 3-1, setting up a clash with city rivals Real Madrid on 24 May. "I want to thank the mothers of these players because they gave birth to them with balls this big," said Simeone, gesturing as if holding a football. "The reaction of the team will stick in people's memories." 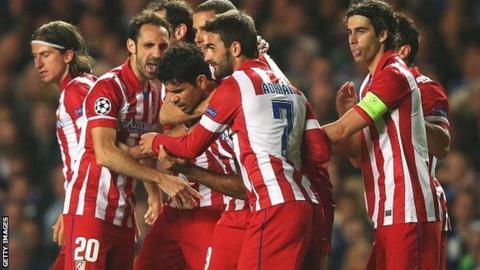 Fernando Torres put Chelsea ahead, but Adrian Lopez levelled before half-time, and goals from Diego Costa and Arda Turan secured Atletico a place in their first European Cup final since 1974. "The players took control of the pitch against a powerful team, with a lot of history in the Champions League, and that makes me very pleased," added the Argentine, whose team are also on course to win La Liga. "We have to be grateful for their effort because without them we could not have experienced what we are." At the final whistle, Atletico's players danced in front of their fans, knowing that Real would be their opponents in Lisbon. It will be the first time two clubs from the same city have contested the final. Real coach Carlo Ancelotti, whose team beat Bayern Munich 5-0 on aggregate to secure their place in Lisbon, said everyone in the Spanish capital was happy. "Those who have experienced these things know that there are no favourites in a final," the former Chelsea boss told Sky Italia. "It is going to be a very balanced match."